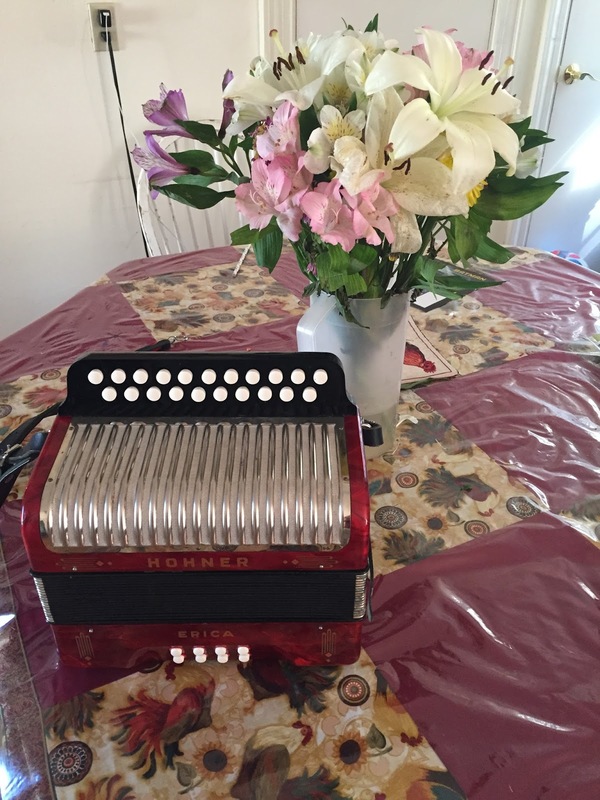 Today I took delivery of my new box, a Hohner Erica A/D, sent from England by its previous owner, a denizen of the inestimable melodeon.net. So, did I want posh box (oh, a Tommy!)? A less expensive posh box (a Lilly)? Or a tiny box (Giordy)? Or a Baffetti organato? I didn’t know. Then this box showed up for sale on mel.net. I was intrigued. I always had a thing for that old fashion Hohner sound, and had actually started on a mighty Corso. The Erica is a classic bog norm box. Jean Blanchard played one back in the day. Then, accordion fettler, bold Lester Bailey, pointed out that he had worked on the Erica and that it was an excellent model of the species. Also, that the seller was very trustworthy. That was enough for me. After adjusting all the straps to suit my massive frame, I made some videos. Be kind, still getting used the action and all that. Thanks for posting this Gary, lovely to see my old Erica settling in to her new home. I like that wet sound more and more as time goes on.